It's one of the highlights of a visit to Disneyland or Disney World's Magic Kingdom. Pirates of the Caribbean is one of the most beloved theme park rides anywhere. And, of course, it inspired an incredibly popular series of films—whose characters, in turn, have been incorporated back into the ride (making it perhaps the most meta theme park attraction ever). There are many reasons why the Pirates ride is so wonderful. (We rank it among the top five best park attractions.) Chief among them is its endearing theme song. The song, by the way, is featured in the Pirates films, The Curse of the Black Pearl and At World's End. "Yo Ho (A Pirate's Life for Me)" is one of the most famous songs to ever grace a ride (second probably only to the "it's a small world" tune—and considerably less annoying). The song begins as soon as the boats make their way down the flume into the pirates’ underground lair. There are different variations of the tune, with different instrumentation throughout the ride. Sure, it's all in great fun, but the words to the song are a bit salty, particularly by Disney's usual squeaky-clean standards. Sing along with the rascals and scoundrels the next time you set sail with them. And be sure to drink up me 'earties, yo ho! Xavier X. Atenico, a Disney Imagineer who also wrote the script for the original ride, penned the Pirates of the Caribbean song lyrics. Like many of the early Imagineers, Walt Disney recruited Atenico from the animation department at the company's studio to work on Disneyland. In addition to his work on Pirates, Atenico helped create the Primeval World diorama, which passengers see aboard the train as they circle Disneyland (and which was originally part of one of Disney's attractions at the 1964 New York World's Fair). Although he was primarily an animator and an artist, Atenico ended up collaborating on a number of songs for Disney attractions. Other song credits include “Grim Grinning Ghosts” for the Haunted Mansion and the music for (the since closed) Adventure Thru Inner Space. The burning city scene was so realistic, the Anaheim Fire Department was initially concerned about the ride's safety. That's one of many historical tidbits uncovered about the Pirates of the Caribbean. 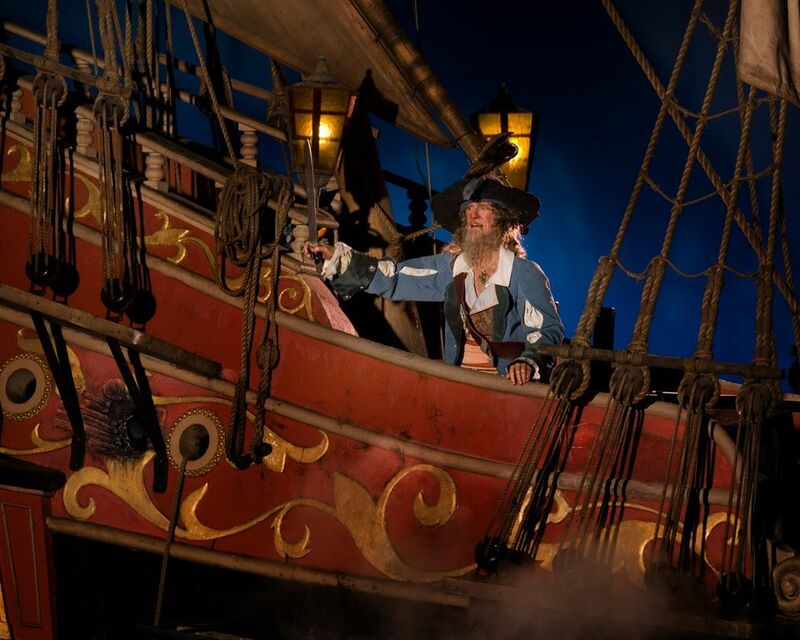 Did you know that Shanghai Disneyland has an entirely different version of the Pirates ride, based on the movies? The incredible Battle for the Sunken Treasure attraction surpasses the original Pirates of the Caribbean (and just may be the world's best theme park ride). There is a hint of the "Yo Ho" song in the Shanghai attraction.